A lot of players hoping to see the possibility of trading but this feature has not been added yet. Perhaps, the developers implement this feature in the MCPE 0.17.0 (read more). But while the Mojang is engaged in the development, you can download the Trading Addon and try this feature. 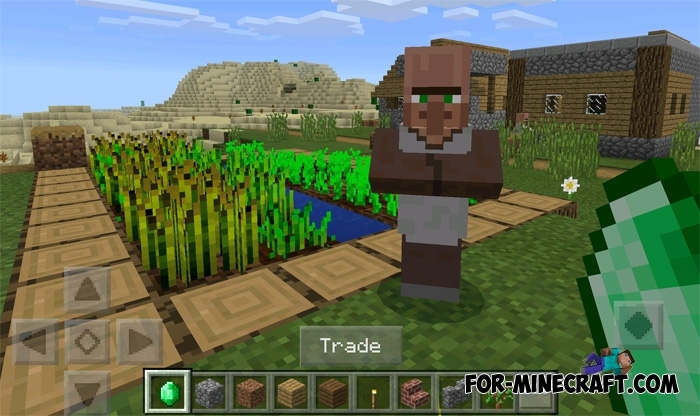 This modification introduces you to the trading function, and ordinary villagers will cease to be useless. You will see only one trade: give emeralds and get a diamond swords. Of course, Trading Addon has only one trade but in the future the author will add more items. Take in hands the emerald and go to the any villager. Then tap on it for a few seconds, and quickly tap on the Trade button in the center of the screen. In some cases the villager can run away. After the exchange, you get only one diamond sword. At the very least it's better than nothing. You can look in your inventory and take your sword. Note: This is not the TradePE mod, addon allows you trade only one item. Read this instruction and follow the steps.